Did The Soviets Build A Better Shuttle Than We Did? For some reason, my social media feeds lately have been filled with images of “Russia’s secret space shuttles” that have fallen into ruin. This is a little puzzling, since those shuttles haven’t been ‘secret’ for decades, and they’ve been in terrible condition for over 20 years. But that got me thinking — was it a better Space Shuttle than the American one? The reason we’ve been seeing so much old Soviet shuttle-related content recently is that a photographer named Ralph Mirebs recently took a trip to the launch facility at Baikonur and took a lot of amazing pictures of the very sad state of the ex-Soviet Shuttle fleet. The original orbiter, Buran, is there, but a roof collapse in 2002 has pretty much ruined it. There’s an atmospheric test orbiter, and the almost-completed second orbiter, Ptichka, left to decay. They’re striking, melancholy photos to look at, stark reminders of dreams unrealized and wasted potential. But all this attention on the old Buran does give us a good opportunity to really look at what the Soviets made there, and wonder, uselessly and in hindsight, if maybe, just maybe, their space shuttle system might have been superior to ours. 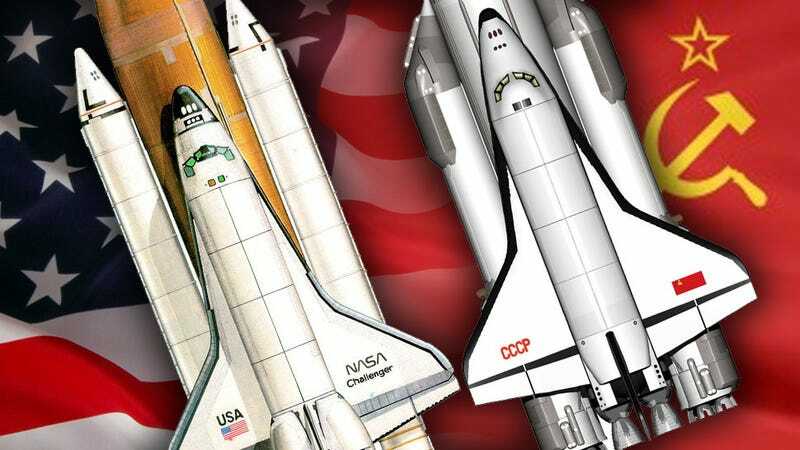 The Soviet space shuttle program came about as a direct response to the U.S. Space Shuttle program, because the Soviets saw the U.S. shuttles as primarily military spacecraft, ones that would eventually be configured to carry nuclear bombs. As a result, the Soviet program was highly military in nature, with all manner of strange and ominous mission plans and Buran variants (even some really odd wingless versions) being developed to create in-space nuclear weapon launchers and military space stations. Most people assume the Soviet space shuttles were just a cheap knockoff of the American shuttles because the orbiters look really, really similar. The truth is way more complex, but a simple answer is that’s sort of half right. The Buran’s basic look and shape was, pretty much, taken from the US shuttles, because even though the Soviets experimented with a lot of quite different-looking concepts, they never found one was that qualitatively better, aerodynamically, from what the U.S. was doing, and since the U.S. had gone through the considerable trouble of proving the design worked by actually launching and conducting missions, there really wasn’t any compelling reason not to just duplicate the basic orbiter design. What’s the biggest difference there? Look at the rear of the orbiters. You’ll notice that the U.S. shuttles have five total engines at rear — two orbital maneuvering engines (OMS) and three very large main engines, used at launch. The Buran has only the two orbital maneuvering engines, along with a bunch of smaller attitude control thrusters. So, why the difference? The answer has to do with the launch vehicles. The US shuttle uses those three main engines to launch it from the earth into orbit. To feed all the fuel to those engines, the U.S. uses that big, central orange external tank. But there’s a problem: those three main engines aren’t strong enough to lift the orbiter and all that fuel off the ground. So, to get everything going high and fast enough to get into orbit, we added the pair of powerful solid rocket boosters (SRBs) to the sides of the tank. So, the SRBs do most of the heavy lifting to get to orbit, and the three main engines take over to do the last leg, acting as a sort of second stage. Once in orbit, those three engines are heavy deadweight. They take up space and mass that could otherwise have been used for payload on the orbiter. For all in-orbit maneuvering, the OMS engines are used. For 99% of the shuttles’ mission, those three main engines are useless mass that has to be brought back home at the end. The more you think about our solution, the crazier it sounds. If those engines can’t lift their fuel, and are then useless when in orbit, why are we dragging them to and from space every mission? Isn’t there a better way to do this? Turns out, there is, and that’s exactly what the Soviets figured out. Really, they sort of had to figure out another way to do this, since their solid-fuel rocket technology was lagging behind the US. So, they made an extremely large and powerful liquid-fueled rocket that, crucially, did nearly all the work of getting the Buran into orbit. The Buran fired its OMS engines for a very final little kick to the proper orbit, but the large rocket assembly, called Energia, did the work, and Buran was just a payload. What this meant is that the Buran didn’t need to carry three big, useless-in-space engines with it for every mission, and that made it weigh less (by about 8 tons) and gave it a payload capacity larger than the U.S. shuttle — where the U.S. shuttle could generally carry about 25 tons up and 15 down, the Buran was capable of about 5 tons more on both those numbers. But, even more important is the realization that in the Soviet approach, the Buran orbiter is just payload for the Energia, not an integral part of the system, like the U.S. Shuttle. That means that the Soviet space shuttle program really got two very separate and capable vehicles from the program: a re-usable space plane with a launch system and a general-use heavy-lift launcher. The Energia without the Buran orbiter could launch an astounding 95 tons into orbit — NASA is only just now planning a new heavy-lift launcher that beats that, the Space Launch System. NASA’s SLS heavy-lift rocket is actually sort of an Energia-style rocket built from Space Shuttle Launch System-derived components. The Energia was only used to launch something other than the Buran once, the black, ominous-looking secret military spacecraft called Polyus. Polyus was an orbital weapons platform armed with a 1-megawatt laser, designed to destroy satellites. Perhaps luckily for us, it suffered a maneuvering error shortly after orbital insertion and burned up in the atmosphere. There was another advantage, and this one is really, really significant from a safety perspective: you can turn the Energia off. That may sound weird until you remember that the SRBs used on NASA’s shuttle cannot be shut off after they start — this is one of the inherent disadvantages of solid-fuel rockets. NASA realized the importance of this after the Challenger disaster, and it’s actually still an issue with the upcoming SLS rockets NASA is currently developing. Liquid fuel gives the Energia system a huge safety advantage. So, the Soviet space shuttle solution could carry more payload and provided a general-use heavy-lift booster as well that was far safer than the solid-fuel solution used in the US. Those are the big advantages, but there’s actually one more, one that was demonstrated during the Buran’s first and only flight. When the U.S. launched our first shuttle, Columbia, in 1981, it had the minimum crew possible — two astronauts. This is, of course, a prudent move when testing a brand-new spacecraft. When the Soviets launched Buran in 1988, it went even further — no crew at all. The Buran was certainly going to be a crew-carrying vehicle, and it even launched with a special diagnostic module that also offered a bit of extra crew space, much like the SpaceLab modules that flew on NASA’s shuttles. But the Buran was capable of fully autonomous flight, something the U.S. shuttles never even attempted. The Buran launched, did two orbits, and landed like an airplane all under automatic control — that’s a pretty significant achievement. Such capability is actually quite useful for a space shuttle orbiter, as it would allow for an unmanned rescue shuttle to be launched in situations where a crew may have been stranded due to issues with their shuttle, such as the tile-damage issue that caused the destruction of the Colombia orbiter. NASA spent a lot of time trying to figure out how to cram a full crew into a rescue shuttle flown up by even as few as two astronauts. Sorry. I guess that’s just not the way the world works.